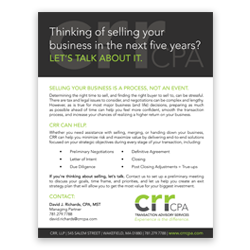 Whether you need assistance with selling, merging, or aquiring a business, CRR can help you minimize risk and maximize value by delivering end to end solutions focused on your strategic objectives in every stage of your transaction. Download our PDF to learn more! Check out our most recent Transaction Advisory blog posts!